Spicy radishes and radicchio stand up beautifully to the hearty flavor of this creamy dressing, made from roasted green onions and greek yogurt. Fire up the grill to cook the onions, if you prefer. Preheat the oven to 450°F. Roast onions on a baking sheet until tender and golden brown, 10 to 15 minutes; let cool. In a blender, purée onions, greek yogurt, 2 tablespoons almonds, tamari, vinegar and 2 to 3 tablespoons water until very smooth. 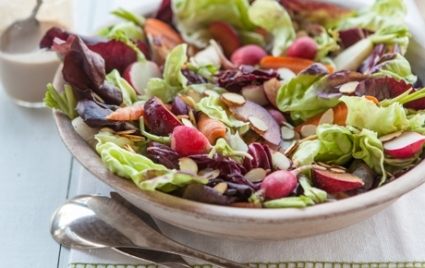 In a large bowl, toss plums, radicchio, lettuce, carrots, radishes, remaining almonds and dressing, and then serve.